A black bear and her three cubs were caught in a bit of predicament after the youngsters decided to go dumpster diving and were unable to climb out of the bin. 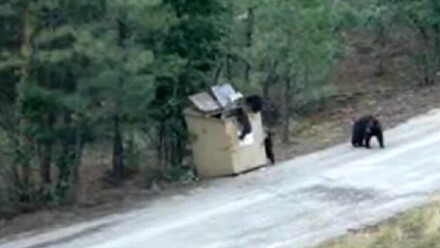 "They know how to open the latch to the dumpster," Shirley Schenk, who helped rescue the bears, told ABC News. "This mother is notorious in the neighborhood." Schenk and her husband Tom, heard the bears crying through the night a couple of weeks ago outside their Ruidoso, N.M. home, and as soon as there was enough light they came to the rescue, armed with a ladder and a pickup truck. Tom backed the truck up to the dumpster and Shirley lowered the ladder into the dumpster so the cubs could climb out. "I was not scared," Shirley Schenk said. "I had my husband driving and I knew we'd drop it and go. … I would have never done that on foot." Shirley said they keep a ladder by the garage door for exactly this situation and have used it two other times. While the ladder is used infrequently Shirley told ABC News she sees black bears about twice a week and they are rarely aggressive. "Any time I see them I just go the other direction on purpose, unless we're playing rescue ranger," she said.